That concept of love affecting priorities makes sense to most of us. However, we who say we love and value God very often give God what we have left over in time and resources. Sure, we will worship God—as long as nothing else is going on. Sure we will give our time and money to God—if we happen to have any leftover from spending it on other things. God’s children need a constant reminder to prioritize God and His plan; don’t give Him leftovers. This is the message that the prophet Haggai delivered to the Jewish people of his day. Because Haggai is unfamiliar to many, let me give you some historical context. 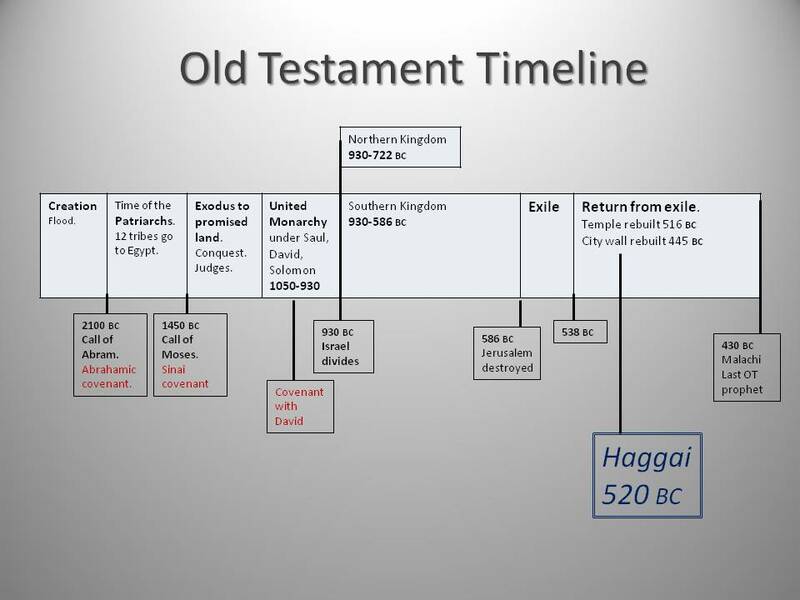 Historical Context: The prophet Haggai ministers in 520 b.c. during the time after the Israelites returned from Babylonian exile (a clearer pdf of the slide can be found here Old Testament Timeline). In 586 B.C. the Babylonians destroyed Jerusalem and took the Jewish people into captivity. When the Babylonians took a conquered people captive, they would send many of the people to other parts of the empire. This practice kept them in line since it is hard to rebel when you are outside your homeland. When the Persians defeated the Babylonian empire in 539 b.c, they had a different policy. They allowed people in their empire to return to their homelands and encouraged them to make sacrifices on behalf of the king. This return was a fulfillment of God’s promise through the prophet Jeremiah that although Israel was being disciplined by the exile, God would bring his scattered people back. Despite their faithlessness, God would be faithful to his people. God worked through the Persian king Cyrus to allow the Jewish people to return to the land of Israel. The first returnees even started to rebuild the temple, but they didn’t get very far and soon abandoned the work. In 520 b.c. the word of the Lord came to a prophet named Haggai, who delivered God’s message to rebuild the temple. Below is the first part of that message. 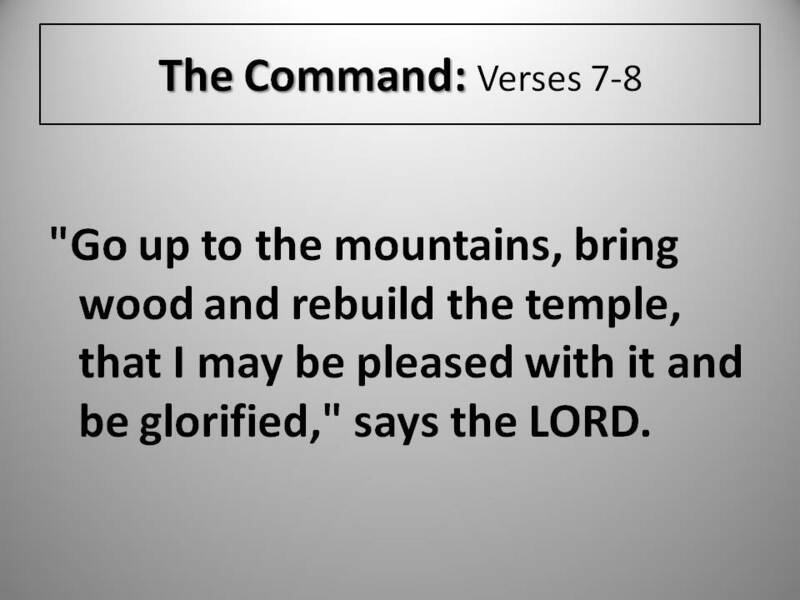 Verses 7-8 contain the main command: “‘Go up to the mountains, bring wood and rebuild the temple, that I may be pleased with it and be glorified,’ says the LORD.” Rebuild the temple; make following God’s plan and glorifying his name a priority. The temple is the place devoted to the glory of God—so glorify God by rebuilding the temple. 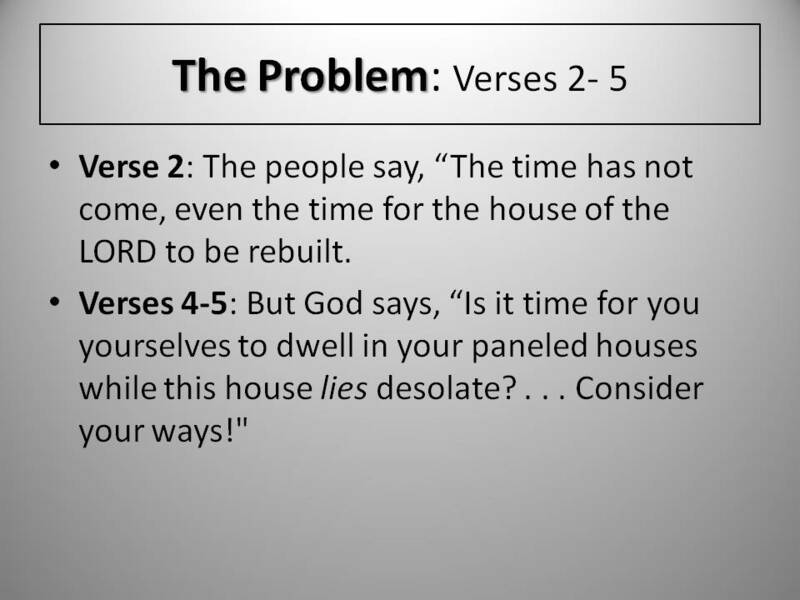 You can build your own houses, so it is past time to build the house of the God; this God you say is above all others. In verses 9-11, God says that the drought and lack of food is a result of their neglect of God’s house. They are not prospering in their own business because they have forgotten being about God’s business. The Jewish returnees use their poor economic situation as an excuse, but God meant it to be a wakeup call. God often allows hardship because in it we realize our smallness and call upon God. Israel needed to consider her ways and return to her God, revering him and following his plan and the covenant that he made with them. How will the people respond to this rebuke? Will they get all offended and go to another fellowship, one that is less demanding? Will they wait until maybe they have some time and money left over to devote to the Lord’s things? That was the approach the they had been following. 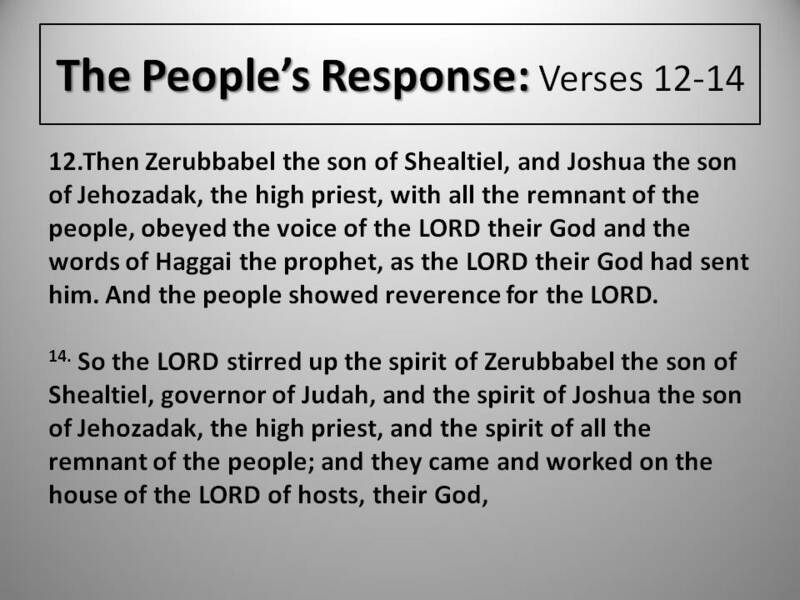 Verse 12 contains the people’s response: “Then Zerubbabel the son of Shealtiel, and Joshua the son of Jehozadak, the high priest, with all the remnant of the people, obeyed the voice of the LORD their God and the words of Haggai the prophet, as the LORD their God had sent him. And the people showed reverence for the LORD.” The people obey the message of God given through Haggai. They restart the building of the temple. Notice the commentary at the end of verse 12: And the people showed reverence for the LORD. This response to put God and his plan back to the top priority showed the proper reverence for God. God is above all, his plan is perfect, he is to be treated as the highest because that is the reality. Up to this point the people were giving priority to their own agenda. But now instead of giving God leftovers they are making him and his plan their priority. Note that verse 14 states the response as God stirring up their spirits to work. This touches on the divine mystery that we even need God’s work and stirring to repent and have the faith that we need. Philippians 2:13 states a similar concept: “for it is God who is at work in you, both to will and to work for His good pleasure.” God works in us to change our desires and give us faith, but yet we are accountable for those choices that WE make. This touches on the deep debate about free will and determinism; but this debate is not the focus of this passage, and diving into that discussion must wait for another time. From this idea of God working in us, we can be encouraged that even when our hearts are not right before God we can still seek him and ask that he would change our hearts. We can pray that he would transform us from the inside-out so that we follow him in true faith. Even if our hearts are not fully on board, we can always respond to God’s commands with “Help me, Lord,” knowing that he can change and work in our hearts. After the people’s good response God gives the people Reassurance in verse 13: “‘I am with you,’ declares the Lord.” When we walk in God’s will, we have the reassurance of his presence. We must be careful here not to think our own work is the basis for relationship with God. Our place with God is based on God’s grace and forgiveness shown through Christ’s work. We place ourselves in a position to receive God’s grace and be a part of his plan. By responding to God’s word in obedience and getting back in step with God’s ways, the people of Israel can know that God is present with them and will provide for them because now they are walking with him. 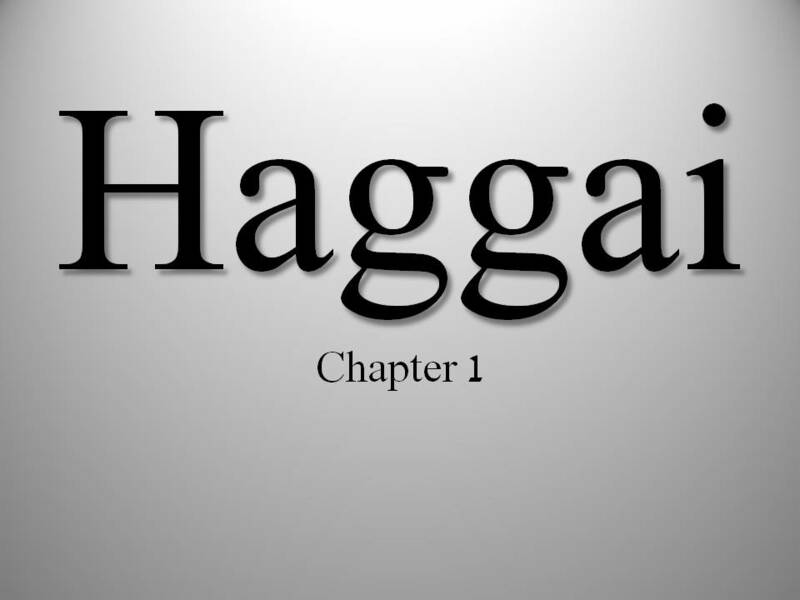 Application: What should be our response to Haggai today? Prioritize God and His plan—don’t give Him leftovers. Like those Jewish people who had returned from exile, we have our own agendas, our own houses to worry about, and we spend our time and resources on our own things first. If there is anything leftover, we will give it to God. The problem with the Israelites, and us, is that our priorities do not match eternal truth. God is above all and deserves all. The issue is not a certain amount; it is the underlying heart of not seeking first the kingdom of God. We seek our own kingdom first, and how we spend our time and resources reflects those priorities. In our consumer culture we are trained from an early age to put ourselves and our interests on top, and then allow the market and businesses to cater to OUR wants. The average American household spends about $2500 a year just on entertainment. That amount is more than what the average household gives to charity. This spending trend reflects the attitude of the average American; we prioritize and value entertaining ourselves more than charitable giving. As we hear the message of Haggai, a proper response would be for us to “consider our ways” and honestly evaluate our priorities. A very objective measure of our priorities can be found in our schedule and our bank statements. These two show what we are spending our time and treasure on. Are we making God and his plan a priority—or just giving what is left over? The house of God is now the people of God, the church, with the presence of God dwelling in us through the Spirit. Just because there is no physical structure, doesn’t mean that God doesn’t have a plan or a place to devote our resources to. The church, not a building but the gathering of believers, is God’s people and plan to make disciples of all nations, to love God and love people. Believers don’t go to church, they need to be the church. Being a part of the new temple of God means we give through our local church and figure out how to advance God’s plan as a local body. Different churches reach different areas and will therefore look different. A church that ministers to a sub-urban community in America will look and do things differently than a church in Beijing, China. These two different churches may have the same mission to make disciples and love people in the name of Jesus, but they will execute that divine plan in different ways. All this to say that the primary way (not only way, but primary way) to prioritize God and his plan is to give of our time and treasure through the local church. A response to Haggai could be to prioritize a ministry in your local church. Instead of giving leftovers, you make that ministry a priority as a way to exalt God in how you spend your time and resources. The important thing is not the specific amount you give or the ministry area you serve. The important thing is making a concrete commitment to prioritize God and his things. You are more likely to follow through with that priority if you find a specific thing to proactively do first. Because our problem is giving God leftovers, so we counteract that tendency by being proactive in making priorities. If you are not a Christian, then you are missing some important context to this message. You are probably hearing a “you should do this” message, or you are hearing a “give more money” message, and you assume that is what religion is about. But please understand that as Christians we trust that our place with God is based on Christ’s work and not our own. I began today’s sermon by basically saying that you shouldn’t treat your spouse like an afterthought and give them leftovers, so why would you treat God that way. But that analogy is limited. Yes, prioritizing God and devoting time and resources to him are an expression of love for God, but God is totally self-sufficient and doesn’t need us. We are the ones who benefit from putting him first. We are the ones who start to produce fruit by being connected to the source of grace and truth. The prioritizing of God is for our own benefit. In the Sermon on the Mount Jesus emphasizes that we not worry because we serve a loving God. In Matthew 6:31-33, Jesus says, “Do not worry then, saying, ‘What will we eat?’ or ‘What will we drink?’ or ‘What will we wear for clothing?’ For the Gentiles eagerly seek all these things; for your heavenly Father knows that you need all these things. But seek first His kingdom and His righteousness, and all these things will be added to you.” Countering the common conception of a quid-pro-quo God, Jesus presents God as a heavenly father, who cares for us and will provide for us because God is a gracious and loving God. We seek God and his kingdom first not just because the reality of the universe is that God is number one and we are not, we seek him first because we trust his heart towards us. If we truly know God as a promise keeping God who saves us because we cannot save ourselves (which he proved through Christ, and he proved to the Israelites by not only saving them from Egypt in the Exodus, but gather them back to their land after the exile), then our response to the call to seek him first is not just to feel a greater sense of guilt and obligation to gather for worship, to give towards God’s work, or other acts of devotion. Our response is thankfulness and a desire to put him first because he is the only one worthy to be in that place. We also trust him more than we trust ourselves–not just for eternal salvation but even for our daily provision. Ultimately we prioritize God because we see he is of ultimate worth and love. We don’t give him leftover time, thought, or resources, for the same reason we don’t give our loved ones these things. We truly value them, we truly feel that they are worthy of being a priority, and we feel the same way about God.